My Food Bucket List Suggestion: How Many Have You Had? 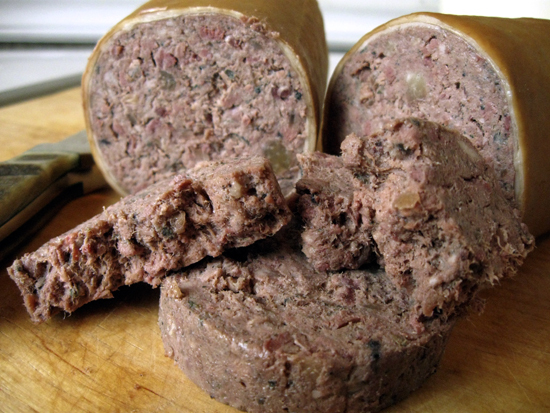 Number 49 on the list, handmade Coarse Liverwurst (Liver Sausage) from Kilgus Meats in Toledo, Ohio. I just eat the stuff by itself, no sandwich required. In December 2006 shortly after starting this blog over at the Monroe News web site, I fell victim to the whole “Foodie Quiz” thing and wrote one myself. Looking back at it now I can see how ridiculous the concept is. The fact is, there’s no way to really define the thing people call a “foodie” because our cultures are different, we were raised in different environments, and to be perfectly blunt, it’s completely unfair to write any kind of “foodie evaluator” that excludes considerations for vegetarians, vegans, Kosher upbringings, or any other nuances in the culture of the person taking your quiz. A few days ago some online friends posted a link to a so-called “foodie quiz”, one that was supposed to be a test of some “rare foods” the quiz-taker might have had. It was entirely boneheaded, completely ludicrous, including staples such as BBQ ribs, pulled pork, maple syrup … and then threw in “purple ketchup”, which is nothing more than a novelty item from Heinz. The “quiz” set my teeth on edge. A lot of the “foodie quizes” out there, and sadly my own from seven years ago included, assume the people who score the highest are “better” at enjoying food than people who score lower. That’s simply untrue. A lot of folks who would never touch a lot of things are actually better educated about the foods they do focus on. That should mean something. I decided to develop a list of a hundred items (frankly an arbitrary number), none of which could be called “rare” but possibly located in just few areas. These would be foods I think people should take the time to try at least once, not an actual measure of anything whatsoever. In letting those online folks who knew about the purple ketchup fiasco know about what I was doing, I did take some suggestions from them. They’re either fellow tech writers or fellow food enthusiasts whose opinions I value. Some of their suggestions did make it into the list. After releasing the Food Bucket List on November 7th I got a nice surprise. My own score on the list, also the number of items on the list that I’ve tried (the items that are bolded), is currently 54%. However, my son Adam who’s now a U.S. Marine ended up with the current high score of 57%. Part of that is not only my insistence that my kids try everything at least once, but also that since his orders have taken him to Japan and Korea, when he was in Okinawa he’s actually had a meal of real Kobe beef that was stuffed with foie gras. And then … ummm … drizzled with chocolate. He picked that over shallot butter. Go figure … But regardless of that, he specifically ordered a food that I may never be able to enjoy since it’s only available there. That makes me proud of what I’ve taught him about food. On the other end of the spectrum is one of the tech writing leads (says she’s a “Manager” … supposedly that’s a better title …) at Symantec Corp. She’s a vegetarian and scored 9%. I might give her a hard time about that (and I do!) but the honest truth is that she does seriously enjoy food her way, and her own Food Bucket List is going to look completely different from mine. And that’s fine with me. Just don’t tell her I said that. There are no right or wrong answers in this one. But remember, if you don’t try something just because you’re squeamish, there are people around the world who likely eat that particular item on a regular basis because either that’s their culture and heritage, or they’re simply so poor that that’s all that’s available to them. Think about it before dissing something completely. So check out my Food Bucket List and use the comment section below to let us know how you did. And maybe why you scored a certain way. Because when it comes right down to it, that’s really the interesting part. The bucket list was great I was at 49 ….but felt good about it…also it pointed out things that I haven’t tried….I loved it! 73% — I guess I qualify as a foodie — and like Char — a technical writer. I got an 11% -_- lol. Loved the quiz I scored 73 percent, yep many strange things I’ve eaten and still have many to try.